The free sticker available from the U.S. Coast Guard looks like this. 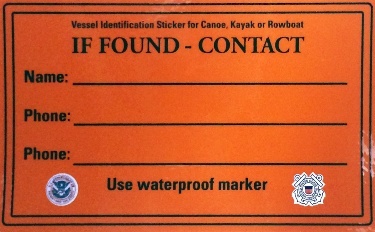 The Coast Guard urges paddlecraft owners to properly secure and label their vessels. Coast Guard crews treat every unmanned-adrift vessel as a search and rescue case and immediately launch a search for potential mariners in distress. Coast Guard officials encourage all paddlecraft owners to label their vessels using a permanent or waterproof marker covered with clear, waterproof tape for increased durability. You can also check with a local outdoor recreation retailer or Coast Guard Auxiliary Flotilla to obtain a Paddle Smart Identification Sticker. At the very least, the label should include the name of the vessel’s owner, a number to reach them. and a secondary point of contact. In the event that the vessel is adrift, crews can use that information to contact the owner and avoid launching an unnecessary search. If the owner of a vessel is unable to be located after a reasonable amount of time, Coast Guard crews are forced to destroy the vessel or turn it over to the state for disposal. Mariners who encounter unmanned-adrift vessels or other hazards to navigation are encouraged to contact their local Coast Guard District Command Center or via VHF-FM Channel 16. The stickers can be obtained for free at local harbormasters, through the Coast Guard Auxiliary, and at select marine retail and supply stores. Similarly, if you lose kayaks, surfboard or safety equipment such as lifejackets, please report it to the Coast Guard to help our search and rescue specialists deconflict possible distress reports. 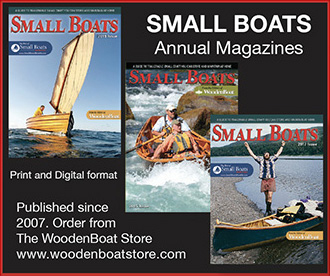 You want to do this for dinghies and other rowing craft and even small sailboats. Anything that can come adrift or you can get separated from and that doesn’t have numbers. You will need to renew the “permanent” marker from time to time.